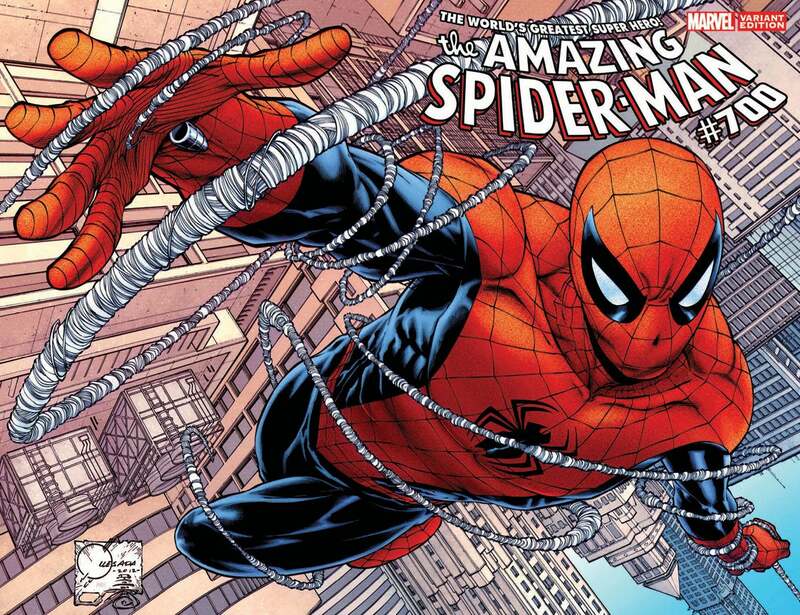 Ever since spoilers for today's The Amazing Spider-Man #700 leaked online two weeks ago, reviewers have been formulating their responses to the issue. That isn't to say that we don't evaluate the full book and the events in context, but when presented with a pretty detailed outline of the book, you can't help but say to yourself, "I hope that reads better in context, because otherwise we've got real problems...!" And that's how the early spoilers for Peter Parker's final issue as Spider-Man read. Why is it a problem? Let's talk about Ed Brubaker's critically-acclaimed and best-selling run on Marvel's Captain America. Bucky Barnes replacing Captain America was able to be drawn out over a number of years because Bucky was a good guy, who had been established by the writers up to that point, and the readers may have wanted Steve back but nobody much wanted to see Bucky die. Handing a title off to a long-time villain who killed your hero on the way to his big, heroic epiphany? Well, we already have that book on the market right now. It's called Edison Rex, and it really only works because fans had no emotional attachment to Valiant (the dead hero in question) going into the first issue. It's unlikely you're going to get Spider-Man fans to rally around the guy who killed Peter Parker. Dan Slott, of course, assured fans that the issue is better in context and that they shouldn't rush to judgment based on a handful of poorly-written spoilers and a couple of shoddy scans. He's absolutely right in that -- but while the story is better in context, it's not enough better to drive this reviewer into the welcoming embrace of Superior Spider-Man. The handful of genuinely good character moments we had in this week's issue simply aren't enough to overcome the ending, and I remain unsold on the notion that this move is more story than publicity stunt. While it's incredibly unlikely that the story will have long-term ramifications, and this is probably just the most epic Peter/Ock showdown in history, the fact that this is only the end of the first act doesn't make the following acts any more attractive to read considering how this one shook out. And that's a big problem: It leaves readers with the impression that "obviously this is not a long-term thing." Nobody is going to believe that Peter will stay dead and few will believe that Dr. Octopus will stay good. How many times have Marvel tried this move with Magneto? It's never stuck for long. That will hurt the book once you get past the first arc or two of novelty, because comics readers abandon series that seem not to have long-term implications for the larger universe. Not long ago, a comics professional I know suggested on Facebook that he should just stop watching a TV show he enjoyed, because it had just been cancelled and the ones on his DVR weren't "going anywhere." When I suggested a comparison to comics--"Would you abandon a comic book because it had been cancelled and has only three issues to live?" --both he and a number of his friends answered that yes, they would, and they do it all the time. My biggest beef with any of these huge, traumatic changes to the status quo on a title is that you have to write them in such a way that it's credible it might stick. Most people go into these knowing (or at least deeply suspecting) that it won't, but you have to combat that idea with your script. A story where the bad guy wins and the good guy dies in ignominy? I'm always talking about how none of these characters ever get their happy ending. Comics are a violation of some of the basic tenets of storytelling becuase we always have to be prepared for the next installment. Even a fake ending for one of these characters shouldn't be so...undignified. It's like the way they killed Bart Allen, or Steve Rogers. In either case, it was quick and dirty, the result of a supervillain who came up with a "grand master plan" that actually worked. But justice was swift, even if a return to the status quo wasn't, which made it OK.
At the end of the day, this ending didn't work. And therein lies the problem with serialized, open-ended storytelling. This is Amazing Spider-Man #700, billed as the final story ever for Peter Parker, one of the most beloved characters in popular culture. Even if this particular story is only now entering its second act, and doing so with a new first issue--it's still not a worthy finale for a character like Peter. And there's no way to get around it--that's sloppy.